I adapted this quilt block Cape Cod from an original design by Susan Davis of Olde American Antiques and American Quilt Blocks. My choice of colour scheme for this block went with the name -- which brings to my mind the sand, sea and (since it is Cape Cod) some rusty red to represent the lobsters that are so famous in that area. This five patch block has lots of things going for it. It features half square triangles as well as quarter square triangles. But -- not only that, this block has what the quilting community often calls the three-quarter square triangle patch. 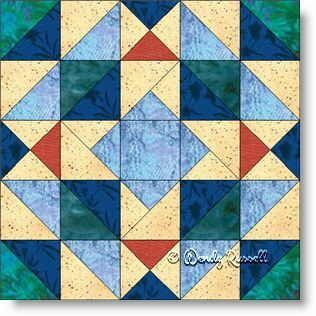 So, all in all, this is a wonderful choice of quilt block for a learning experience. I chose to construct this block as an uneven nine patch, rather than in five rows of five patches, just because I find it easier that way. Feel free to choose which sewing method you prefer. The sample quilts illustrated give you some idea of what you can do with this block in a whole quilt.